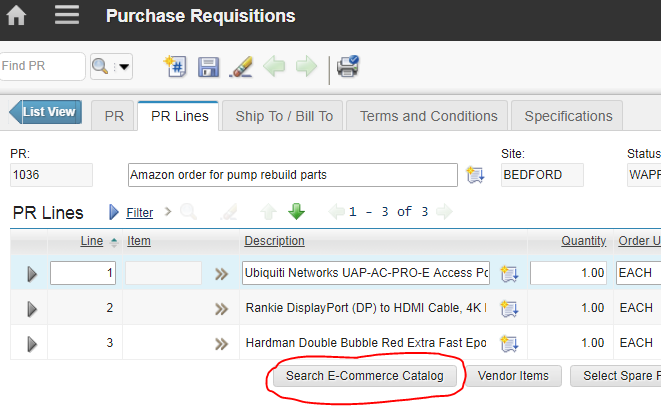 This cost effective and high-ROI plugin enables anyone who requisitions materials in Maximo to jump to online vendor catalogs that are available through your company’s account with 3rd party e-commerce platforms or catalog providers, such as Amazon, Grainger, and Ariba. The user can select items from the selected vendor’s catalog, and return those order lines with accurate and item identification and pricing directly to the Maximo Purchase Requisition or Purchase Order. When the Maximo PO is approved, it can be manually or automatically transmitted to the target e-commerce platform or supplier to complete the ordering process. The Maximo PO is updated with e-commerce system acceptance details and the buyer would typically receive an order confirmation email from most systems such as Amazon. More Accurate Orders: Accurate Vendor Pricing and Item Identification – Less Order Rework!